Rediscover the lost Gita examines the entire Uddhava Gita in relation to other Hindu scriptures, especially the Bhagavad Gita, and shares its teachings in light of interreligious understanding and non-sectarian spirituality. A foreword written by prominent Hindusim scholar Charles S.J. White joins the author's own introduction lay out the Uddhava Gita's background, philosophical dimensions and religious significance. This edition does not include the original Sanskrit, nor does it labor to translate each word verbatim. 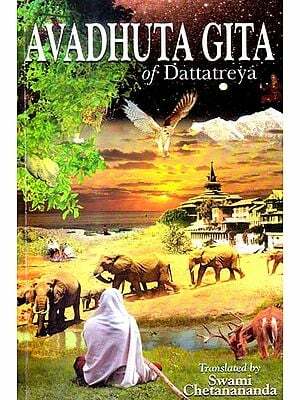 Rather, it gives the reader all 1,030 verses in plain English, offering accessible commentary that allows the meaning and relevance of the Uddhava Gita to unfold to one and all. Steven j. Rosen is an initiated disciple of His Divine Grace A .C. Bhaktivedanta Swami Prabhupada and editor – in – chief of the Journal of vaishnava Sstudies, an academic quarterly esteemed by scholars around the world. He is also associate editor of Back to godhead, the magazine of the Hare Krishna movement. The author of over twenty books, his recent titles include Essential Hinduism and The Yoga of Kirtan: Conversations on the Sacred Art of Chanting. The Uddhava Gita is virtually unknown in the West. 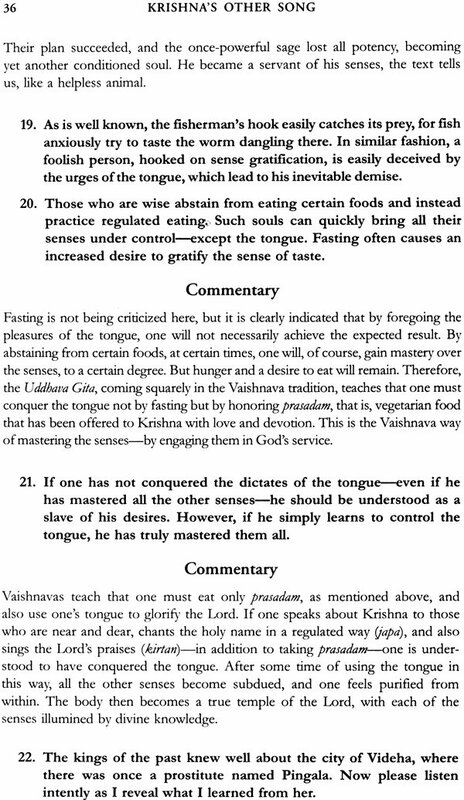 In contrast to its cousin text, the Bhagavad Gita, which now claims more than 2000 translations in some eighty languages (not counting those in various Indian dialects), it exists in only five or six translations, several of which are severely outdated, are written in poor English, with archaic commentaries (irrelevant in the west), and otherwise are inaccessible. In addition, at least three of these efforts are written from the Advaita Vedanta Perspective which tends to neglect the overall tenor of the Uddava Gita's message, that is, devotion to a personal Deity. Just as the Bhagavad Gita is found in the Bhishma – parva section of the epic Mahadharata, a text that focuses on the worship of Lord Krishna, the Uddhava Gita shines forth from the Eleventh Book of the Bagavata Purana, which emphasizes devotion to the Lord. In lieu of this simple fact, the Uuddhava Gita properly unfolds only within a bhakti (devotional) context, which narrows down the existing translations to two: the work of (1) Bhumipati Dasa and that of (2) Hribdayananda Dasa Goswami and the Bhaktivedanta Book Trust. The former work is available mainly in India, and it is directed to an Indian audience, including two dense, traditional commentaries and the original Sanskrit for each verse. It is an unwieldy volume directed primarily to practitioners. 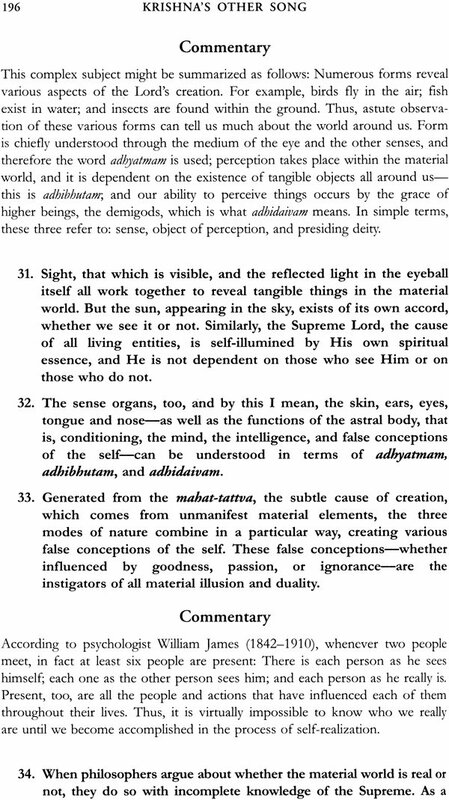 The leatter teanslation, completed by Hridayananda Dasa Goswami and his Sanskrit editor Gopiparanadhana Dasa, is the best of the few that do indeed exist. Complete with original Devanagari text, Roman transliteration, word – for – word synonyms as well as lucid translation and commentary, this edition is recommended for serious students. 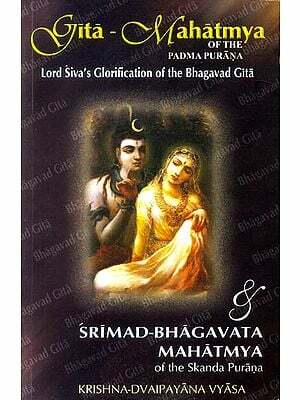 But only for serious students: it is not published as a separate volume but only as part of the larger Srimad Bhagavatam (Bhagavata Purana) with the Uddhava Gita alone comprising four volumes at some 300 pages each. If the Bhumipati version is unwieldy, this version is downright intimidating. Enter Krishna's Other Song: A New Look at the Uddhava Gita. Here the author augments existing translations by adding context and relevance, readability, and accessibility. This edition does not include the original Sanskrit, already available in other scholarly volumes, nor does not include to translate each word verbatim. Rather, while giving the reader all of the text's 1,030 verses in plain English, it Offers an accessible commentary, especially written for modern students of Hinduism and South Asian studies – as well as for those with a penchant for Indian spirituality. The emphasis her is not on literal translation but on overall meaning and gist, in cases in which verses speak for themselves, no commentary clutters these pages. But if illumination is needed, in the sense of clarifying concepts, defining obscure Sanskrit words, or unpacking complex philosophical ideas, Krishna's Other Song will offer words of wisdom. And so, in this new publication, Steven Rosen again shows that he is in the top rank of contemporary scholars of the Vaishnava- Hindu tradition, sharing with the world fresh and enlightening insights into the teachings of Lord Krishna. Among andcient India's Sanskrit wisdom texts, the Bhagavata Purana stands out in terms of its poetic quality, coherent structure, and philosophical sophistication. 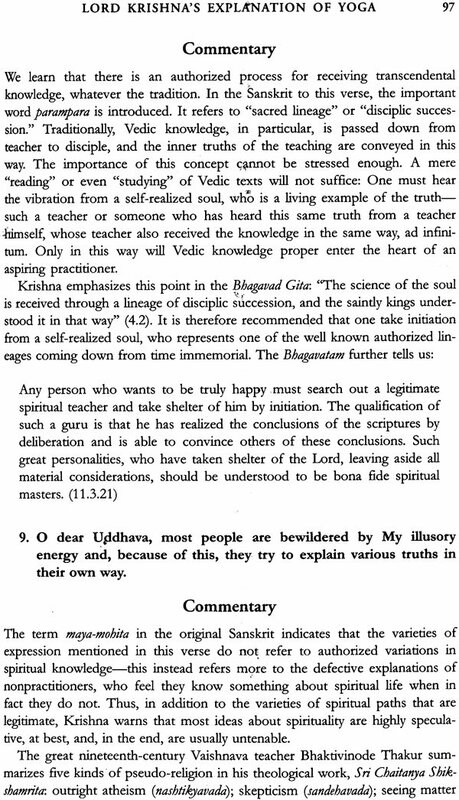 The tradition itself sees the Bhagavadta, as it is sometimes called, as the cream of all Vedic and post- Vidic writings. 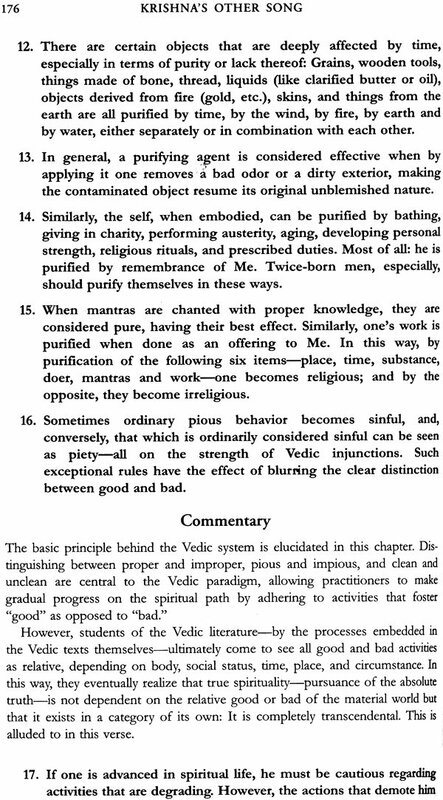 Accordingly its twelve massive cantos or "Books", have been foundational for the Vaihnava tradition, and they continue to exert an unparalleled influence on popular Hinduism. 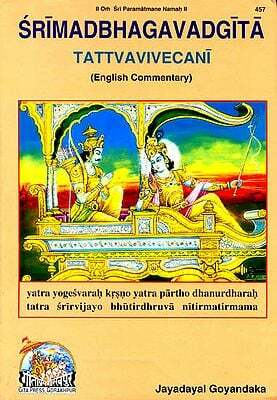 Just as the Bhagavad Gita, which is originally part of the Mahabharata, often has been published as a separate, stand alone text, so too has the Uddhava Gita, which is part of the Bhagavata's Eleventh Book, been published as a separate volume. Despite this special attention, it has never enjoyed the popularity of the Bhagavad Gita, especially in the west. Among Vaishnavas and Hindus in general, however, the Uddhava Gita is one of the most frequently quoted sections of the Bhagavata. It is unmatched in its systemic development of Vaishnava theology on a wide range of topics from the importance of detachment and the contemplative life to passionate love, from the organization of society to a theology of nature that is spiritually informed. Ultimately, it teaches the secrets of love of God. The Uddhava Gita is a profound philosophical dialogue between Lord Krishna, who is viewed in the vaishnava traditions as God, and His intimate devotee Uddhava. 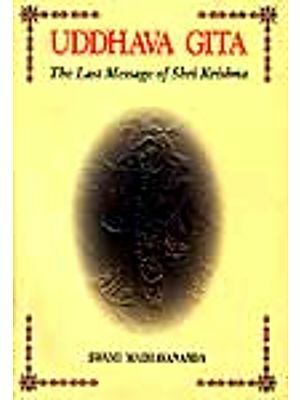 The book is one of the many "gitas" associated with the pan-Hindu theistic tradition. Though the bhagavad Gitais arguably the most famous of these gitas, the tradition offers us Gita Govinda, Gopi Gita, Venu Gita, Bhramara Gita, and many others. 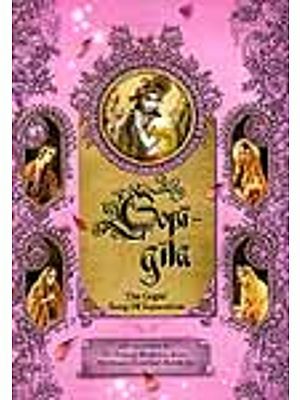 Gita simply means "song" and within the context of Indian's sacred literature, it refers to particularly mellifluous and blessed songs of divine truth, uttered by great devotees or by the Lord Himself. Undoubtedly the Bhagavad Gita was spoken by the Lord on the Battlefield of Kurukshetra just to encourage Arjuna to fight, and yet to complete the transcendental knowledge of Bhagavad Gita, the Lord Instructed Uddhava. The Lord wanted Uddhaava to fulfil His mission and disseminate knowledge that He had not spoken even in Bhagavad Gita. It is not that Prabhupada is minimizing the significance of the Bhagavad Gita, which he elsewhere praises as being among the most spiritually uplifting and otherwise edifying works known to man. But he is saying something about the unique importance of the Uddhava Gita. In fact, the Uddhava Gita may be the most important of the genre, for it focuses on Lord Krishna's final instructions before leaving the earthly plane. More these instructions are delivered to uddhava, who is recognized by the tradition as mahabhagavata, or "greatest amongst the devotees", and as mukhyam Krishna-parigrabe, "foremost of those who are intimate with Krishna" (Bh.P 3.4.24). He is also Krishna's cousin, and practically His twin. In addition, as opposed to the Bhagavad Gita, which Krishna originally spoke for Arjuna's benefit on the eve of what was to be a devastating battle, the Uddhava Gita was relayed to Uddhava for the purpose of enlightening sages he was to go to the Himalayas and once there, to brighten the light of those who already were set ablaze with transcendental knowledge. They, in turn, were to share this knowledge with the world. For these reasons and others, it is curious that the Uddhava Gita has never enjoyed the fame of its cousin text, the Bhagavad Gita with which it shares several Gitaverses in common. In certain ways, the Uddhava Gita goes beyond the Bhagavad Gita, illuminating its central teaching ofdevotion to Krishna and emphasizing the importance of seeing Krishna everywhere, in everyone, and all times. 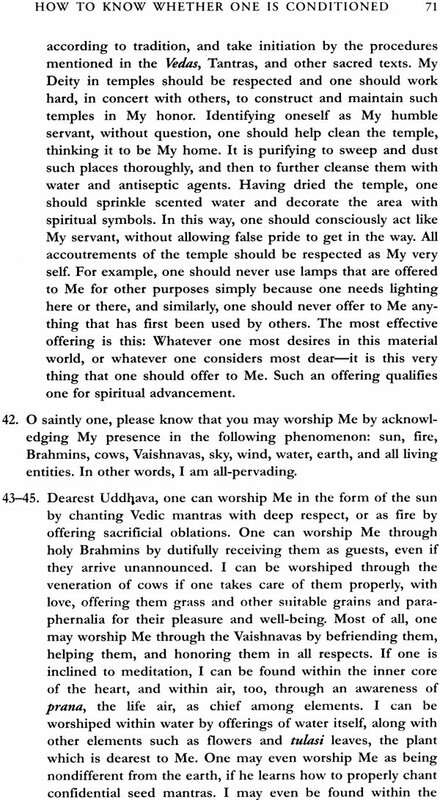 In the epic Mahabharata (Adi 186.18) we are introduced to Uddhava but without specifics. We are told that he was present at the marriage of Draupadi and, later (Adi 218.11), that he was an important guest at another celebration convened at Mount Raivata. We are told that he was a disciple of Brihaspati (the teacher of the gods) and that he possessed unequalled intelligence. it was he who brought the dowry for Subhadra's marriage to Arjuna and was a central figure at the wedding in Indreprastha (Adi 220.30). And when the power mad Salva besieged Krishna's city of Dvaraka, Uddhava was the valiant hero who saved the day (Vana 15.9). Moreover – and perhaps more relevant to our subject hand the great epic tells us that Uddhava was present just before Krishna left the mortal world, before the destriuction of Dvaraka, the Lord's city. At that time, the Yadavas with whom Uddhava was aligned went to live at Prabhasa Tirtha, located on the western seacoast of India. The journey to Prabhasa is also described in the Bhagavata Purana, in the chapter immediately preceding the Uddhava Gita. Anticipating Dvaraka's impending cataclysm, uddhava left the yadavas' association, knowing that Krishna was planning to terminate his own activities in the world of men (Mahabharata, Mausala, Chapter 3 and 4). Still, although Uddhava is directly mentioned in the epic, he usually is discussed as part of a group, and his individuality is not yet developed. It is not until we come upon the Bhagavata Purana that the personality of Uddhava really comes to life. We first cross his path in the Third Book – in a story that actually occurs out of sequence. (The Bhagavata rarely tells stories in chronological order). Here, Uddhava meets Vidura, Dhritarastra's brother and supremely intelligent advisor, who asks Uddhava about his conversation with Krishna gound later in the eleventh book and also about krishan's associates and family members. Uddhava and Vidura meet on the bank of the Yamuna, a Significant river in Vaishnava theology. At this point, the Bhagavata informs us of Uddhava's single minded devotion, telling us that from the age of five he was absorded in Krishna and nothing more (Bh.P. 3.2.2) it tells us of Uddhava's spirituality in terms of bodily symptoms, that is he visibly cried tears of live and that divine ectasy emanated from his very being. Clearly, Uddhava is no ordinary player, even in this most transcendental of dramas.